On September 17th 2010 I reported the sale of the 40.33m motor yacht Opal C and now Simpson Marine tell me she's back on the market renamed Lady Arraya. Delivered by Oceanfast in 1990 and last refitted in 2003, this superyacht was one of the largest all-aluminium yachts in the world at the time of her launch. Easily recognisable by her large round windows, the spoiler on her stern makes her unique. 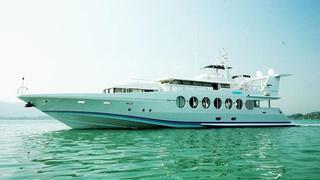 Designed by Jon Bannenberg, Lady Arraya has accommodation for eight guests in a master, VIP and two twin cabins, while her twin 3480 MTU engines powering twin waterjets give a cruising speed of 20 knots and a range of 2,200 nautical miles at 12 knots. Lying in Thailand, Lady Arraya is asking US$3.2 million.